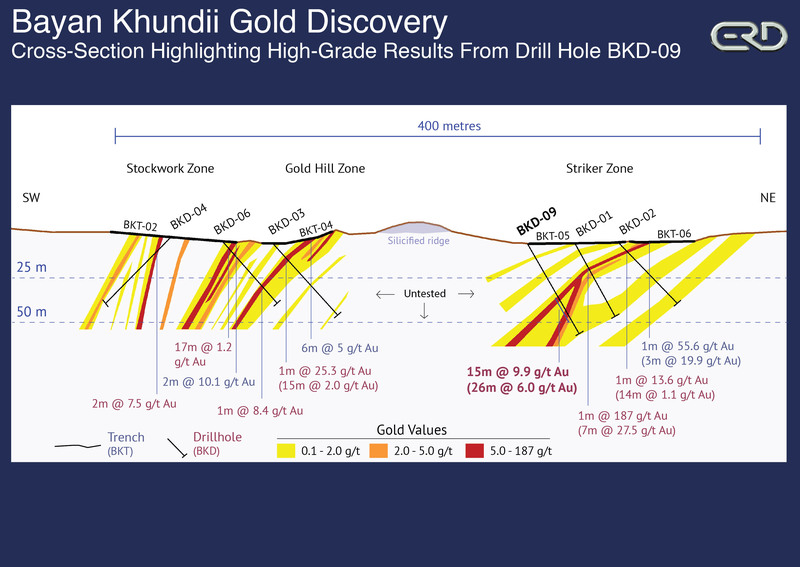 Erdene Resource Development Corp. (TSX:ERD) ("Erdene" or "Company"), is pleased to announce final results from the remaining nine holes of its 15 hole, maiden drill program completed in Q4 2015 at its wholly-owned Bayan Khundii Gold Project ("Bayan Khundii") in southwest Mongolia. This latest round of drilling has established lateral and vertical extensions of the high-grade Striker Zone at Bayan Khundii. The maiden drill program commenced on November 8, 2015 and consisted of 15 angled (45 to 60 degree) diamond drill holes ('PQ' size core) totaling 695 metres. Drill hole depth ranged from 31 m to 70 m (average 46 m) with maximum true vertical depth of approximately 50 m. The table below summarizes the drill results received for the final nine of 15 drill holes. Results of the first six drill holes, reported on December 9, 2015, are included in the table for reference. * Reported intervals are not true width. They represent drill intersection widths from holes drilled at a 45 to 60 degree angle. The Bayan Khundii mineralization is moderately dipping (approximately 40 to 50 degrees) perpendicular to the drill hole angle. The drill program targeted the southwest portion of the Bayan Khundii prospect, a 550 m by 300 m area, where previous surface sampling and trenching completed by the Company in Q3 2015 returned highly anomalous gold values. 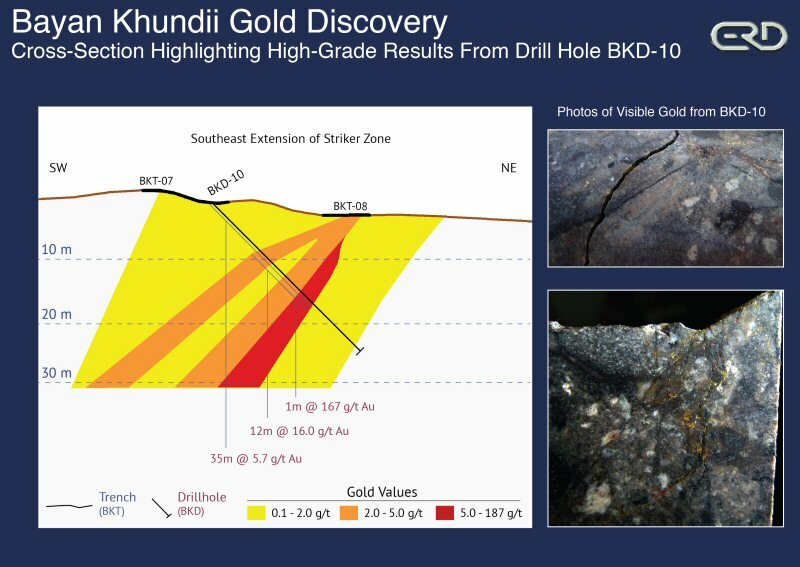 Click here to read the Company's October 5, 2015 press release announcing the Bayan Khundii discovery. The Q4 drilling program intersected zones of quartz breccia and comb-quartz veins within pervasive silica- and sericite-altered volcanic host rocks with extensive primary hematite veins and fractures. Visible gold was observed in 10 of the 15 drill holes within a number of quartz veins as irregular-shaped grains, up to 2 mm (see attached photos). The gold mineralization is associated with quartz veins and/or hematite within, or along, the boundary of quartz-hematite veins and veinlets. The main mineralized veins are interpreted to dip at 40 to 50 degrees to the southwest. Two cross-sections are included with this news release highlighting the orientation of mineralization. The intensely altered host volcanic units also carry anomalous gold mineralization (varying from 0.1 to 1.0 g/t gold over wide areas) associated with fine quartz and/or hematite veinlets. The strong, pervasive alteration and widespread primary hematite indicate a large intense alteration system that has positive implications for the potential size of the system. The Company completed an induced polarization geophysical program over the Bayan Khundii prospect in Q4 that indicates the mineralization is located at the apex of broad positive chargeability and resistivity anomalies. Additional exploration of this high-grade gold discovery is now in the planning stage and is expected to include a second phase of diamond drilling and metallurgical testing during the first half of 2016. Included with this news release are maps, cross-sections and photos highlighting results of the Bayan Khundii drill program. 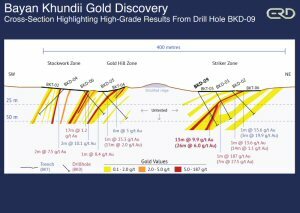 In Q2 2015, Erdene conducted an initial exploration program on the southern portion of the Company's 100%-owned Khundii license. 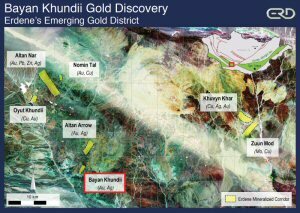 This reconnaissance work led to the discovery of the Bayan Khundii ('Rich Valley') gold prospect, located 20 km south of the Company's flagship Altan Nar gold-polymetallic project. Two separate mineralized zones were subsequently identified over a 1.4 km long area that remains open in all directions. 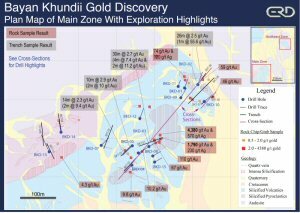 The Khundii exploration license is in its 6th year of a 12-year term, and has no associated royalties. Erdene's sampling protocol for drill core consisted of collection of samples over 1 m or 2 m intervals (depending on the lithology and style of mineralization) over the entire length of the drill hole. Sample intervals were based on meterage, not geological controls or mineralization. All drill core was cut in half with a diamond saw, with half of the core placed in sample bags and the remaining half securely retained in core boxes at the Company's Altan Nar exploration camp. All samples were organized into batches of 20 samples including two commercially prepared standards. Sample batches were periodically shipped directly to SGS in Ulaanbaatar via Erdene's logistical contractor, Monrud Co. Ltd.
As a result of the coarse nature of some of the gold mineralization at Bayan Khundii, the Company has initiated a screen metallic testing program on higher grade samples to assess potential variability. Erdene Resource Development Corp. is a Canada-based resource company focused on the acquisition, exploration, and development of base and precious metals in underexplored and highly prospective Mongolia. The Company holds four exploration licenses and a mining license located in southwest Mongolia. These include: Altan Nar - an extensive, high-grade, near-surface, gold-polymetallic project that the Company is aggressively advancing toward a production decision, however the Company has not yet completed a mining study to support the technical feasibility and economic viability of Altan Nar; Bayan Khundii - an early-stage, high-grade gold discovery made in Q3 2015; Khuvyn Khar - an early-stage, copper-silver porphyry project with multiple drill targets and significant copper intersections; Zuun Mod - a large molybdenum-copper porphyry deposit; and Altan Arrow - an early-stage, high-grade, gold-silver project. In addition to the above properties, the Company has an Alliance with Teck Resources Limited on regional, copper-gold exploration in the prospective Trans Altay region of southwest Mongolia. For further information on the Company, please visit www.erdene.com. Erdene has 105,060,005 issued and outstanding common shares and a fully diluted position of 124,271,495 common shares.